Advances in Hydrogen Production, Storage and Distribution reviews recent developments in this key component of the emerging "hydrogen economy," an energy infrastructure based on hydrogen. Since hydrogen can be produced without using fossil fuels, a move to such an economy has the potential to reduce greenhouse gas emissions and improve energy security. However, such a move also requires the advanced production, storage and usage techniques discussed in this book. Part one introduces the fundamentals of hydrogen production, storage, and distribution, including an overview of the development of the necessary infrastructure, an analysis of the potential environmental benefits, and a review of some important hydrogen production technologies in conventional, bio-based, and nuclear power plants. Part two focuses on hydrogen production from renewable resources, and includes chapters outlining the production of hydrogen through water electrolysis, photocatalysis, and bioengineered algae. Finally, part three covers hydrogen production using inorganic membrane reactors, the storage of hydrogen, fuel cell technology, and the potential of hydrogen as a fuel for transportation. Advances in Hydrogen Production, Storage and Distribution provides a detailed overview of the components and challenges of a hydrogen economy. This book is an invaluable resource for research and development professionals in the energy industry, as well as academics with an interest in this important subject. 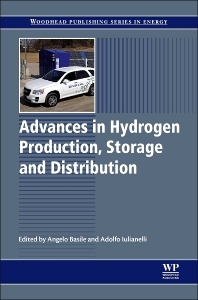 Advances in Hydrogen Production, Storage and Utilisation provides a detailed overview of the components and challenges of a hydrogen economy and is an invaluable resource for research and development professionals in the energy industry, as well as academics with an interest in this important subject. Adolfo Iulianelli, Degree in Chemical Engineering in 2002 at University of Calabria (Italy), obtained his PhD Degree in Chemical and Materials Engineering in 2006 at University of Calabria (Italy). Nowadays, he is working at the Institute on Membrane Technology of the National Research Council of Italy (CNR-ITM). He is author or co-author of more than 50 international articles (ISI), 1 patent, more than 50 contributes as oral and poster presentations in national and international conferences, more than 20 book chapters. Furthermore, he is Reviewer of more than 20 international ICI journals, Invited Speaker in more than 5 international conferences, training school, etc. Subject Editor of the Scientific World Journal, Guest Editor for the International Journal of Hydrogen Energy (ICI) and Journal of Membrane Science and Technology and Associate Editor of International Journal of Membrane Science and Technology. His research interests are membrane reactors, fuel cells, gas separation, hydrogen production from reforming reactions of renewable sources through inorganic membrane reactors and membrane operations. His h-index is 22 (source: www.scoupus.com).